Fast & Easy DIY Valentine Crayon Holders for the Whole Class! 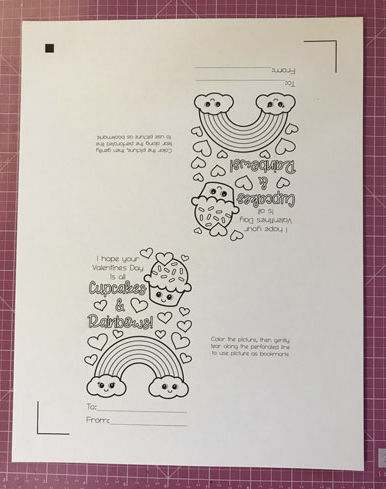 Looking for a fun and unique Valentine for your child to hand out to their classmates? 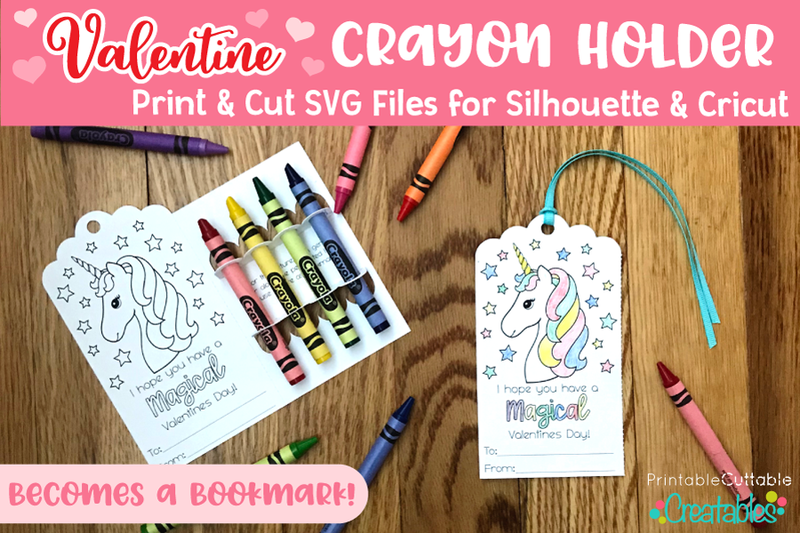 These Valentine Bookmark Crayon Holder SVG files cut super fast and are so easy to put together! 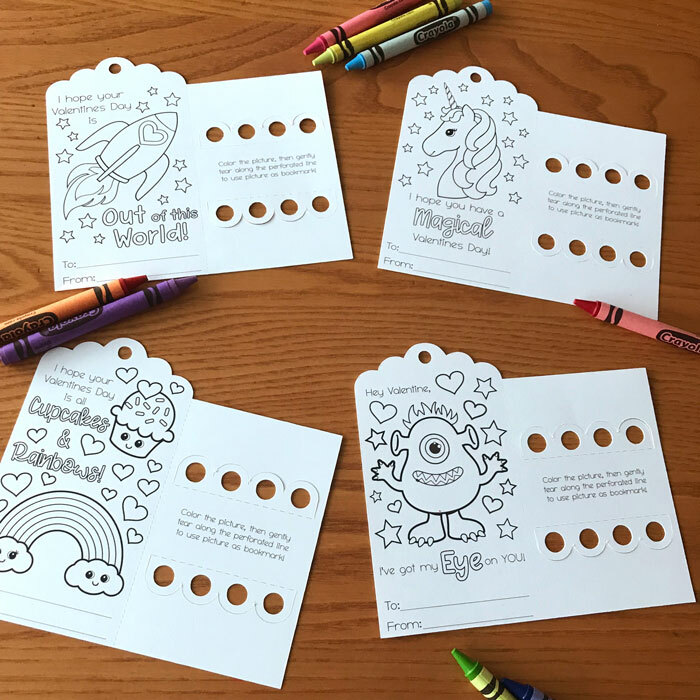 And the best part is, after kids have finished coloring in the fun Valentine’s designs, the card becomes a bookmark they can use to hold their place in a favorite book! I made these last year with my daughter for her Kindergarten class and they were a hit! 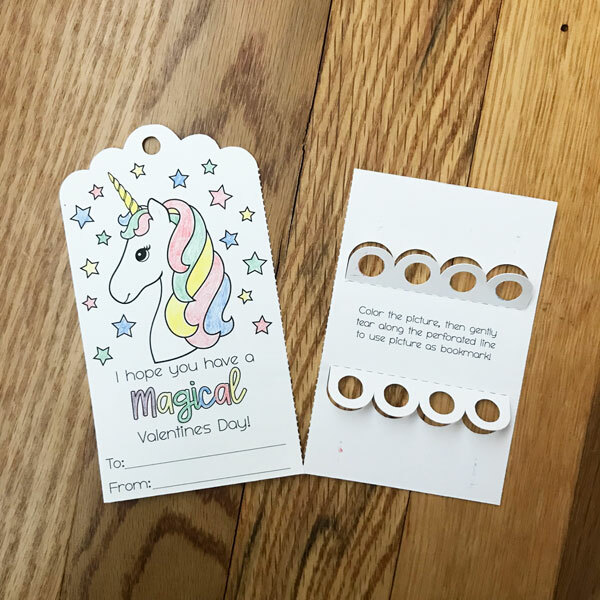 You can download the Valentine Bookmark Crayon Holder SVG Files right here in my shop, but first, read on to see how easy they are to make! The SVGs open up with cut lines already turned on in Silhouette Studio Designer Edition. Just position 2 on a page, turn on registration marks, and hit Send! 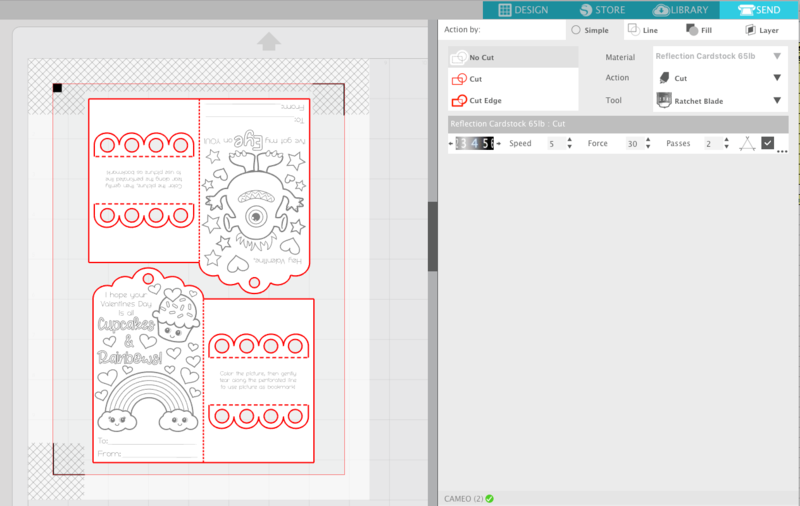 With just a few simple steps (instructions included with download), Silhouette Basic Edition, and Cricut Design Space users will also be ready to go! Important: In Silhouette Studio, once your Print & Cut layout is ready to print, DO NOT move or change any elements in the file! I always make sure to save the file right before I print it, and don’t make any changes to the layout once it has been printed. 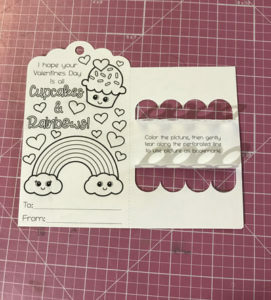 The Valentine Crayon Holder SVGs cut fast, and pop right out of the sheet! Have your little one fill in their friend’s names and then fold along score lines, to fold card in half and raise the crayon holder holes. Now insert crayons into the crayon slots. The crayons slide in pretty easily (pointed tip first) and hold in place well. This was easy enough that even my 5 year old was able to help! 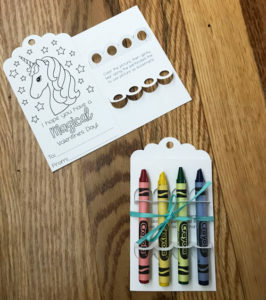 I found this 24 pack of Crayola 4-ct. Crayon Boxes on Amazon, which I love because each child gets 4 different colors to use, and it comes with enough to make coloring page Valentines for the whole class! Once assembled, just tuck into some A1 size envelopes (approx. 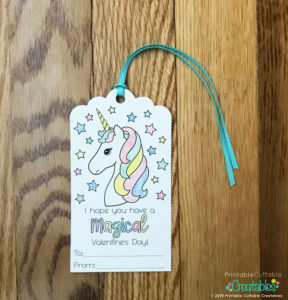 3.5″ x 5″) and your little one is ready to hand out Valentines to their classmates! The kids then get to have some fun coloring in the coloring page design! When they’re finished, they can tear along the center perforation, and it becomes a bookmark! 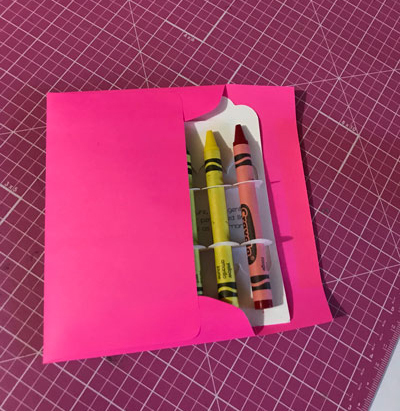 You could even wrap the card in ribbon or baker’s twine (optional) before placing in the envelope, so the child can tie it to their bookmark when they’re all done coloring! 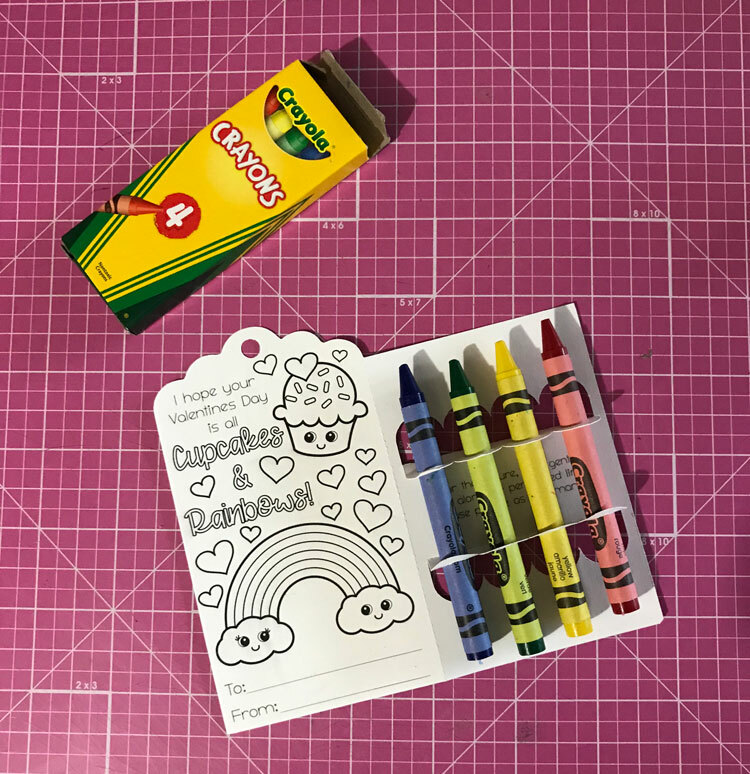 Thanks for stopping by to check out these fast & easy DIY Valentine Bookmark Crayon Holder SVGs! 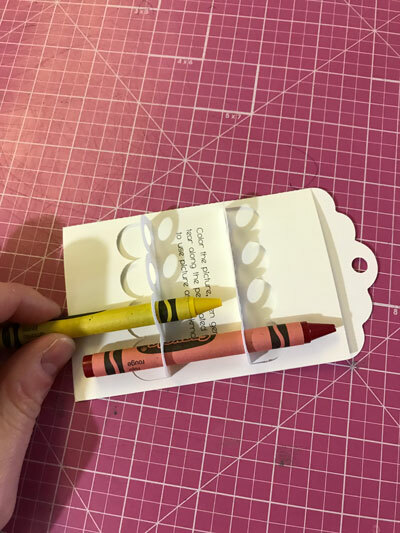 If you give this Crayon Holder SVG a try, I’d love to see how yours came out! Come share your finished Valentines in my Crafting with Printable Cuttable Creatables Facebook Group!